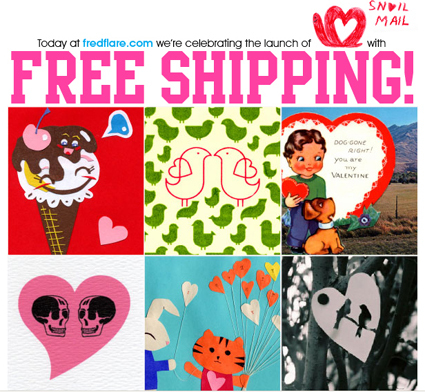 Today when my Fred Flare newsletter hit my inbox I was super excited to see one of the Valentines I made for charity smiling back at me from the top right hand corner! “Dog Gone Right You are my Valentine” could be yours for just $4 and the proceeds go to Elder craftsman. 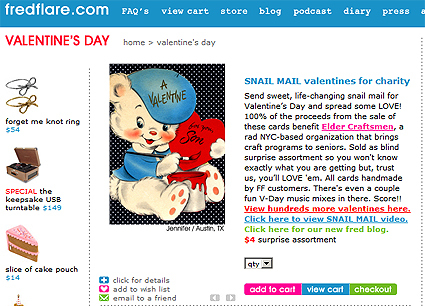 You can also see the one I made that says “A Valentine for You Son” on the Fred Flare website. Cute as can be handmade Valentines for a good cause, what’s not to love. There is too much love on Etsy for us to keep it to ourselves. So this year, we decided to share the love with a project we’re calling Special Delivery. This Valentine’s Day, we’re teaming up with Citymeals-on-Wheels to bring nutritious meals, handmade greeting cards and companionship to thousands of homebound elderly New Yorkers. Easy! We need your help to supply the cards. Citymeals-on-Wheels serves over 18,000 people, so we need as many as we can get. There are two ways to do this. The first is (you guessed it) to make your own card or send in a vintage card from your shop and fill it out with a nice message. Please craft as many valentines as you would like and send them to us. Before you send them, you can also post photos of your cards in our brand new Special Delivery flickr group. If you don’t have time to make cards, you can buy them and have them delivered to us. The deadline for us to receive the cards is Monday, February 2, 2009. There are a few other important guidelines for this, so please carefully read the FAQ’s below. Special Delivery! We will collect all the cards and bring them to Citymeals-on-Wheels, where each will be delivered along with a meal on Valentine’s Day. Several of the Etsy admin will be volunteering that day. We’ll be tromping around the city with hot meals and friendly conversation to brighten the day of local seniors. No! Each Etsy member who sends a card (or cards) will be featured on a Special Delivery page that will be linked from a banner on the Etsy home page. When you send your cards, please include a separate note with your username and user ID number. It’s a win-win situation for everyone. 1. How do I participate in Special Delivery? If you make the card(s), please be sure to include a note with your Etsy user name and ID number. If you buy the cards, please ask the seller to include a note with your Etsy user name and ID number when they mail the package to the above address. *To find your user ID number, go to your shop home page. The number is at the end of the web address. It will look like this: etsy.com/shop.php?user_id=123456. So, in this example it’s 123456. 2. When do the cards have to arrive at Etsy? The deadline is Monday, February 2, 2009. This is important! 3. Are there any rules about what the cards should look like? No glitter! This creates food safety issues. Please make your cards cheerful by using bright colors. You can decorate cards using paint, crayons, markers, pastels, collage or anything else you can think of. Please avoid dark backgrounds and religious symbols. Please write clearly and in large print, and avoid using the abbreviation “V-day”. Please say, “Valentine’s Day”. You should not give out your address or suggest that the recipients write back to you. Initiating an ongoing correspondence is not appropriate. Please make sure that the cards are appropriate for the intended audience. That is to say, pretend it’s for your elderly grandma, not your snarky, angst-ridden teenage brother. 4. How many cards should I send? 5. If I buy a card, does the seller get credit too? No, but you could certainly tell them about Special Delivery and encourage them to send us their handmade cards, too. In that case they should include their own user names and ID’s as well. 6. Is this open only to Etsy sellers? Nope. This is open to anyone who wants to help brighten someone’s day. You do have to be an Etsy member to be included on the Special Delivery page, though. 7. Can I send vintage cards? Sure! The more, the merrier. 8. What’s that deadline again? We need to have all of the cards in our hot little hands by Monday, February 2, 2009. Thanks! Posted January 31, 2009 & filed under Valentine's Day.